The longtime Diner of the neighborhood the Foursome Diner (3074 Avenue U, Brooklyn, NY 11229) has closed for good. oh no! they weren’t THAT good…but they were closest…. I can’t believe they’re gone! not the best food around, but they were close and would do in a pinch. agree..not the greatest food, but they were close and had decent parking.. plus…they were right across the street from 24. I am family of the owners and they are reopening in the spring on nostrand and x where the old chinese buffet was! I just heard about this. I took this photo of The Foursome in the 1970s. Did it make it to the new location? Will miss this place – always a warm welcome and happy faces. Will follow them wherever they may go!!! 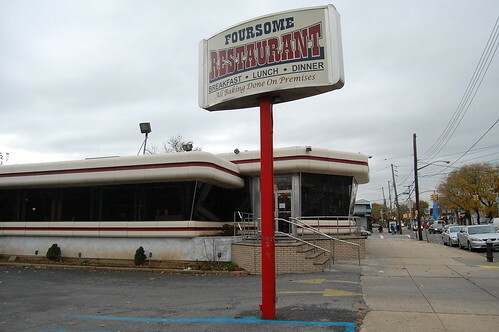 I miss the Foursome Diner. It was definitely better than Perry’s.